According to the recent rumors it has been revealed that two top tech giant companies Apple and Google soon going to launch an exceptional new gadget concepts for their users in future which will be called Apple iWatch and Google Glass. 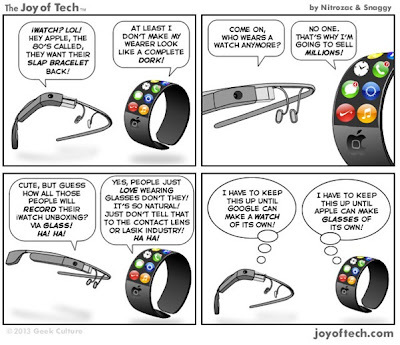 So on this note a comic company called Joy of Tech has published a new Comic on Apple iWatch VS. Google Glass Concepts which seems to be getting popular on Internet and on Social Media websites. 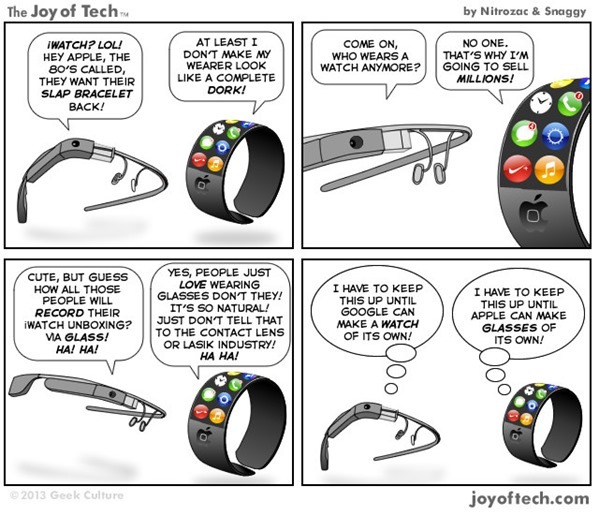 The Apple iWatch and Google Glass Comic tells a true story in most funny way and it’s also tell people which gadget will be most popular amongst Tech Geeks all over the world and why, so we are sharing the Joy of Tech comic based on Apple iWatch and Google Glass Concepts and we hope you will find it funny indeed.